Gordon Brown’s resignation — or, to be exact, his announcement that he is ready to stand down as Labour leader — was the decent thing to do for someone who has just led his party to defeat in a general election, coming second in the popular vote with only 29 per cent, and losing 91 seats. But, as the results came in last Friday morning, Labour were not the only losers. The Conservatives didn't win either, despite getting more votes, and more seats. Any opposition party worth its salt, taking on an unpopular, 13-year-old government after a long recession, and with the support of most of the press, should have romped home. With the leg-up that an unsophisticated voting system gives the dominant party, a mere 40 per cent of the votes would have given them an overall majority in the House of Commons. The fact that they couldn't even manage that — nudging their vote up by only 3.8 per cent — makes it clear how few British voters have been won over by the David Cameron-branded Conservatives. But the biggest disappointment will have been felt in the Liberal Democrat camp. Despite all the media hype about 'Cleggmania' after their leader's widely-acclaimed performance in the series of TV debates, they finished the night five seats down, and their share of the vote crept up just 1 per cent to 23 per cent. Their vote actually fell in Scotland where, in a very different political atmosphere, support for Labour was up. The 'personality politics' that favour Clegg and Cameron in Middle England play very differently north of the border, where the Tory leader's Eton vowels are an instant turn-off and where instinctive sympathy for the embattled Brown is only deepened by resentment at the London-centred media's relentlessly negative portrayal of him. Ironically, one of the seats the Liberal Democrats lost — to Labour — was Rochdale, scene of 'bigotgate', the Prime Minister's unhappy encounter with Gillian Duffy, which was fanned into a flame by Sky News and picked up with indiscriminate glee by the other channels. Clearly, Lancashire voters are not swayed by such media froth. Religious leaders in Britain may take pleasure in the fact that another LibDem seat to fall was that of the National Secular Society's Dr Evan Harris, a vocal and untiring opponent of anything that gives religious belief a place in the public arena. The same fate befell another prominent secularist, LibDem MP Paul Holmes in Chesterfield. So, what happens after an election that everybody lost? The negotiations taking place now are due to one simple fact: given the antipathy of most of the smaller parties to the Tories, it is plain that neither they nor Labour can govern without the support of the Liberal Democrats. It was always their ambition to hold the balance of power in a hung parliament, but now, as one commentator put it, Clegg's dream has become his nightmare: he has to choose between two unattractive alternatives. A deal with the Conservatives would appear to respect voters' desire for 'change' but has four considerable drawbacks. Firstly, the policy differences are enormous — irreconcilable, it would seem, on the key areas of the economy, taxation, defence, Europe, immigration and the LibDem touchstone issue of electoral reform, which the Conservatives have always vehemently opposed. Secondly, the very idea of supporting the Tories would have life-long Liberal activists all over the country tearing up their party cards in disgust. Thirdly, it would be electoral suicide in many of their other remaining 57 seats. And fourthly, to be associated with a government that is going to have to make across-the-board cuts in public services in the coming months or years is not an appealing prospect. Doing a deal with Labour is also a risk. Even with Brown out of the picture, propping up a government that has just lost a general election will be seen by many as thwarting the will of the electorate. A Labour government, too, would have to begin a program of painful cuts that the LibDems would be more comfortable opposing. Furthermore, Labour and the LibDems do not command enough seats between them for an outright majority: they would need the support of at least two of the Scottish, Welsh and Northern Irish parties, making any deal more complicated and fragile. On the other hand, there is more policy agreement on that side of the house — both parties see themselves as 'progressive' and are essentially left-of-centre — and, crucially for the Liberals, there is much less resistance within the Labour Party to reforming the voting system — in fact many Labour MPs have been arguing for it for years. And when it comes to the crunch, a deal with Labour would be much more acceptable to LibDem members across the country than any agreement with the Tories. Part of the problem is that the idea of coalition government is alien to the current generation in Westminster, and associated with weakness and failure. But recent experience in Scotland and Wales is that coalitions can deliver good government. Legislation can't be forced through, it has to be argued for and negotiated. Parliamentary votes have to be won by reasoned argument. There are more checks and balances, and — in principle at least — more accountability and responsiveness to the views of voters. 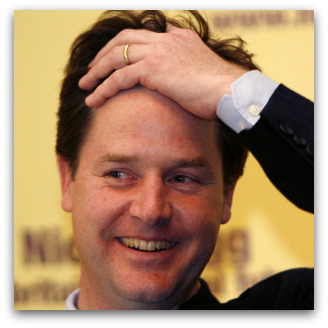 So far, Clegg and his party seem to be keeping their options open. They are wise not to rush this decision. If a coalition deal can be done — and made to work — then after the election that everybody lost, it could be the British people who are the winners. Peter Scally SJ is founder of Eureka Street's sister publication in the UK, Thinking Faith. Recent articles by Peter Scally. An excellent article. Helps us understand the issues. Thank you. Excellent article. Congratulations, Eureka Street, on the speed in getting this article out there. You have just about matched the mainstream media in including news of Gordon Brown's resignation. Thanks, ES for another fine Scally article. As expected, Eureka Street's sister publication in the UK is pro-leftwing. The decision has now been made, the deal has now been done. The inclusivists are into bed with the exclusivists. The consequential issue is hardly likely to inherit any of the Lib Dem principles. It is not Abbott's prerogative to tell people how they should react to the truth. The electorate can now never know when he is attempting to be honest. Apparently, he would happily accept electoral support even while knowing he has deceived the people. The arrival of Jessica Watson back in Australia was small news in cosmic terms, but provoked a great deal of discussion around the coffee pot. Most had to do with values. Some questions said more about the questioners than about the sailor.